Raw Snickers in Dark Chocolate is a healthy and vegan dessert. Creamy dates blend with peanut butter to create a delicious sweet made in no time. A chilled snickers bar in one hand and a warm matcha latte in the other – this is my current situation as I write to you. I’m sitting by the window on yet another cold San Francisco day, not wanting to leave the warmth of my house. I have cozy moccasin slippers on and as some would call them, balloon pants, but as I call them, fun/travel pants, on and if you’re really curious, it’s the pants in this photo. I almost always wear loose clothing when I do shoots. Tight clothes that pull drive me nuts and distract me from what needs to be done – which is to take a photo of some really delicious food before I eat it or before it melts, in which, both cases are equally probable. For some reason I had it in my mind that I was going to hold off on sharing this recipe with you and post a different sweet instead (dark chocolate mouse) but as I’m eating a slice, in this moment, with the photos already complete, it made no sense to postpone. Instead, I’ve asked everyone who walks through my front door to try a slice and to tell me what they think. And two things have been unanimous -- 1.) they love the flavor of the bars – surprised that they actually taste like snickers and 2.) to please cut the bar smaller because THEY ARE HUGE! Start by making the nougat base. In a food processor pulse the macadamia nuts into a flour consistency or close to it as possible. Then add in the rest of the ingredients and blend well, until a thick and smooth base forms. Now line a small baking pan (mine was about 7x7) with parchment paper and pour in the nougat mixture. The nougat will be very sticky so do your best to make an even layer about 1/2 inch thick. Place it into the freezer to harden while you make the caramel. In the food processor, add in all the ingredients for the caramel layer except for the peanuts (but do include the peanut butter). Blend until the dates are well broken down and have formed a creamy paste. Then stir half of the peanuts into the mixture. Pull the nougat base out of the freezer and layer the caramel on top evenly with a spatula. Sprinkle the rest of the peanuts on top of the caramel (seen in the photo above). Pop this back into the freezer for another 30 minutes to harden. Once the snickers are done freezing, remove them from the freezer and cut them into 12 bars. Now make the chocolate sauce using the double boiler method. Fill a small saucepan with 1/2 cup of water and place a separate glass or metal bowl on top, covering the saucepan below (this is the double boiler method). Once the bowl on top is hot and the water below it is boiling, add the chopped chocolate pieces to the top bowl and let it melt, stirring slowly. Remove the chocolate sauce bowl from the heat right after all the chocolate has melted. Now take each snickers bar and place one slice on top of a fork and dip the snickers bar into the chocolate sauce. Place the bar onto a baking rack and let the chocolate harden for 15 minutes in the freezer. Store the bars in the freezer/refrigerator for up to a few weeks and enjoy! Have you tried a healthy and raw take on snickers before? On any other classic dessert? I'd love to know which one if your favorite and I'll try to recreate it too! 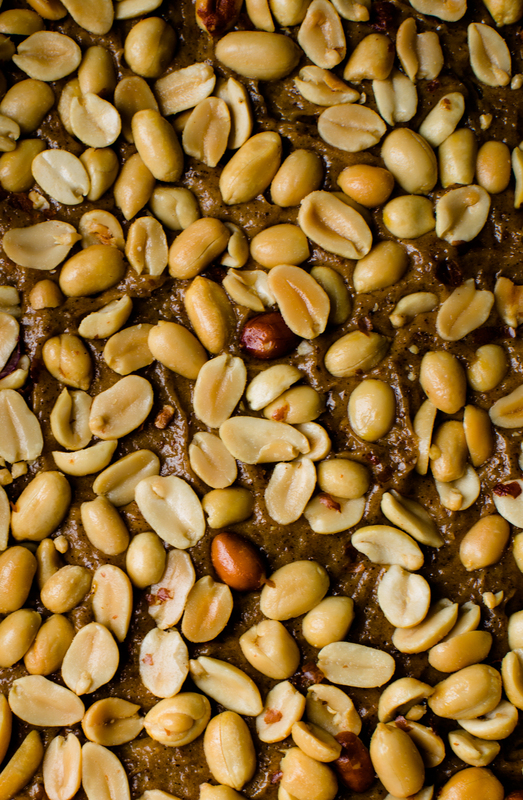 And if you like Bounty or Almond Joy Bars than you might love this recipe! Delicious recipes, foodie travel guides, and lifestyle inspiration all delivered to your inbox weekly. Already in the loop? No need to subscribe.